Stylish wooden restaurant dining armchair with a faux leather seat in a choice of 12 colour options. European beech solid wood frame in a further choice of eight finishes. Designed for both commercial and domestic dining. 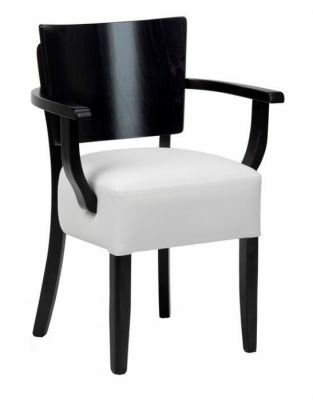 Stylish dining chair manufactured to a commercial standard. The frame of the chair is available in a range of stained wood finishes with contrasting fabric upholstery also to choose from. Constructed with a solid wood frame.